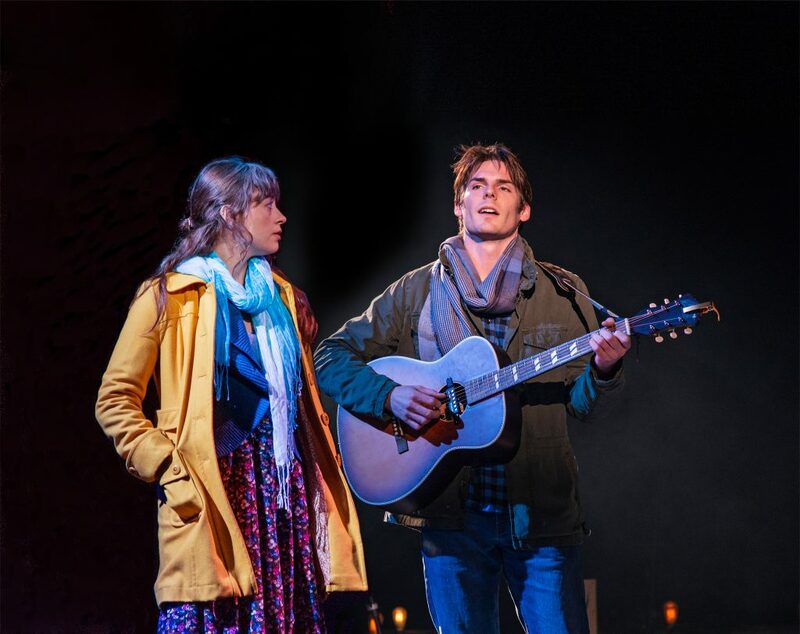 Olivia Nice and Corbin Mayer star in ONCE. 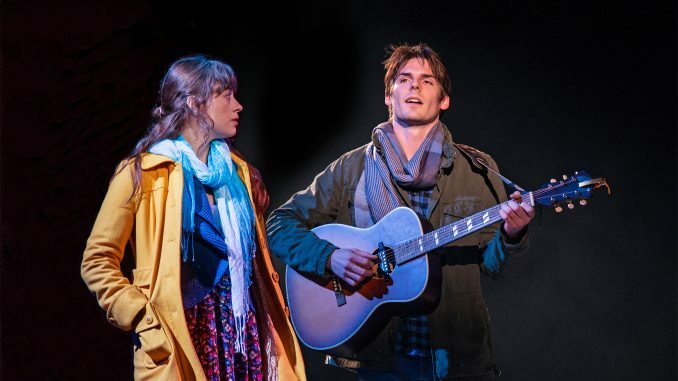 The musical Once, now playing at the Zach Theatre in Austin, has a hidden meaning in plain sight: the two lead characters have no name. They are just Guy and Girl. Realising the story is bigger than the characters is the most direct idea to keep in mind when watching this over-long production. It is based on a movie that ran less than 90 minutes; the runtime of the musical is 2 hours and 25 minutes. Once made its Broadway debut in 2012, and won an impressive 8 Tony Awards, including Best Musical. The film also won an Academy Award for best song, Falling Slowly, which is certainly the highlight of the stage show. It was my opinion and that of others I spoke to at the Zach Theatre that much of the music in the first act was monotonous (one said it sounded like whining). Combined with a very slow pace of story development (not helped by a thin plotline) one person told me it took him half of the first act to figure out what the play was all about. The monochrome nature of the tunes would not have been so noticeable were it not for the fact cast members performed in the lobby of the Zach Theatre first, followed by more lively and energetic music on stage before the play began. If the play had been able to keep pace with the pre-act show, it would have been much more fun. But as the Girl says more than once in Once, she is Czech, and is thus always serious. I spoke to a lady in the audience of Czech origin, and she was quite pleased with the meshing of the Czech personality with that of the Guy, who is Irish. In this production the Girl is played by Olivia Nice. She has performed this role before, at the Oregon Cabaret Theatre. Corbin Mayer, who plays the Guy, has a very fine voice to match the tall, dark, and ridiculously handsome character demanded of the play. Together they spark off one another as a matchless (pun intended) on-stage duo, exactly what the play needs to keep its head above water. The boy-girl unrequited love concept has been done countless times by Hollywood and Broadway so breathing life into a musical with only very minimal subplots to divert ones’ attention is no mean feat. They both do a superb job. 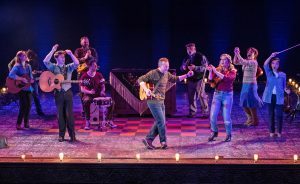 A piano sitting on what appears to a floor inlaid with a large chessboard is a subtle visual clue about what is going on in this play, where boy and girl make move after countermove, not sure if they want to dance together or dominate one another. Unfortunately they do not dance with one another in the musical, which I found to be a major lost opportunity to advance the storyline. The story was written around musical poetry, which alas did not include dance. I found the a capella version of a song entitled The Moon, performed by 11 cast members, to be the best example of this musical poetry. In the end, the Girl overplays her hand. I won’t say why, to avoid spoiling the ending, which some regarded as muddled. She is already married you see, and he loves a girl in New York…. you get the idea. It’s a universal conundrum. Whatever its faults, Once is worth seeing as one of the most honoured musicals of the 21st century. Just don’t compare it to the most honoured musicals of the 20th century, when the masters gave us a golden age never to be recaptured.